After a couple days in Bend, we headed toward the coast on the way back to my hometown of Crescent City, CA (just south of the Oregon border). 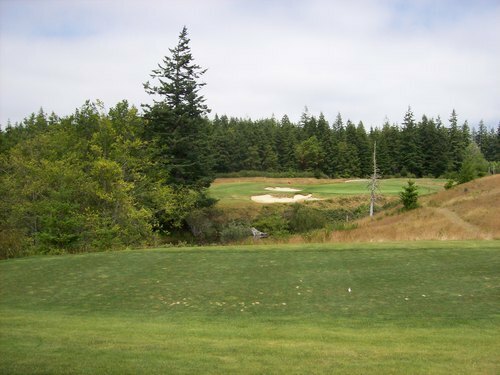 The drive was a little longer, but it was an excuse to check out the other two courses in Bandon that I hadn’t played yet. 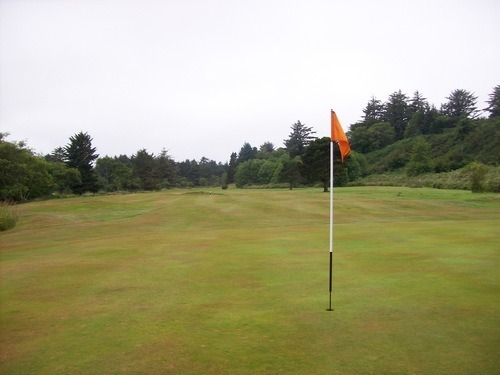 One is becoming rather well-known (Bandon Crossings) as a good companion course for people visiting the Bandon Dunes resort. The other, well, you’ll never hear much talk about it. That’s what I’m here for. Note: This course is now closed. 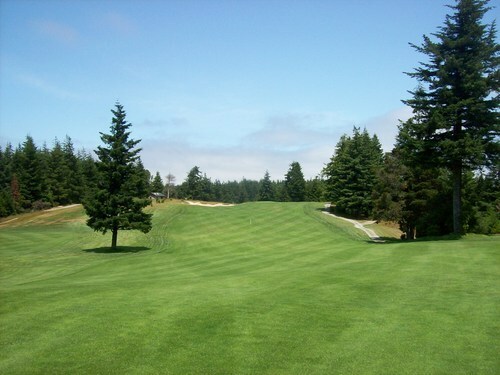 Assuming you’ve never heard of it, Westmont Golf Course was opened in the 1920s and is the old muni course in town, ultimately changing its name to Bandon Face Rock somewhere along the way. 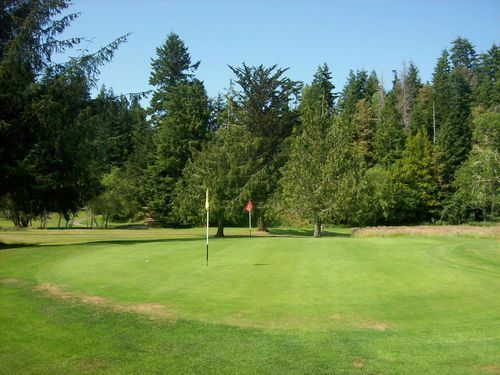 It’s a pretty basic 9-hole layout that plays to a par of 32. The layout itself is not the story there, though. After some rough years, the course actually closed for a little while. 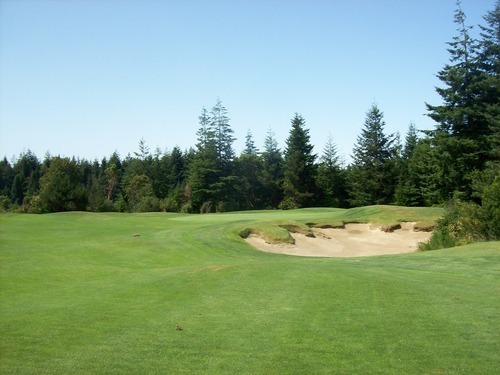 Some new owners came in, did some minor renovations and reopened the course as Old Bandon Golf Links. 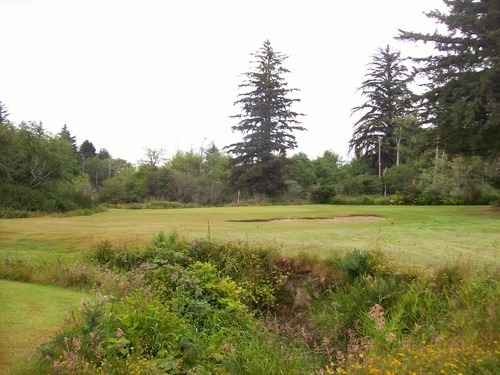 You have to applaud the idea to turn around their biggest disadvantage (trying to compete with Bandon Dunes and the newly opened Bandon Crossings for attention) and actually try and get some spill-over business from it. 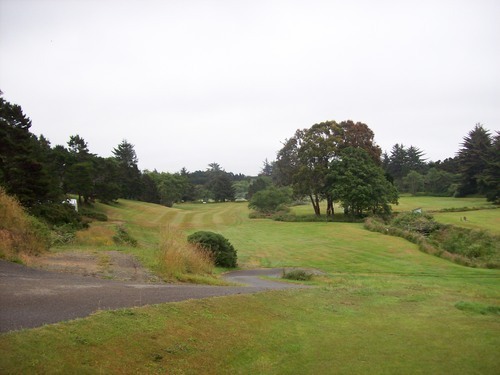 Not only did they try to brand themselves as another old-fashioned links course in town, but they took it a step further by re-introducing a truly “old timey” experience as a playing option. 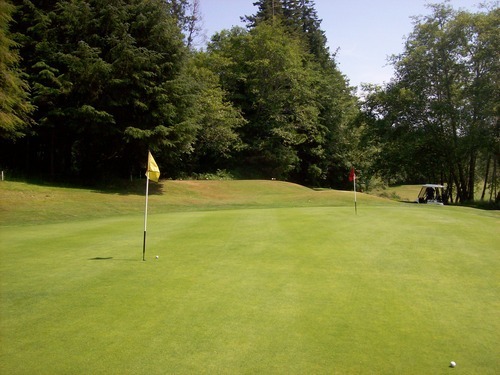 They decided to rent out hickory-shafted clubs and old style balls–replicas from the 1920s era when the course first opened. Rather than pouring too much money into the course, which would never be anything too special, they tried this interesting marketing approach. In addition to old style clubs, they also put sand boxes on each tee box for players to handcraft their own damp sand-based tees like they would have done back in the day. 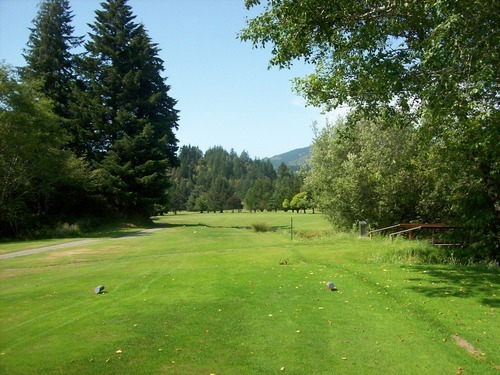 You can still find some YouTube videos with people playing here with the old clubs and balls. Otherwise, the word just did not get out enough it seems. 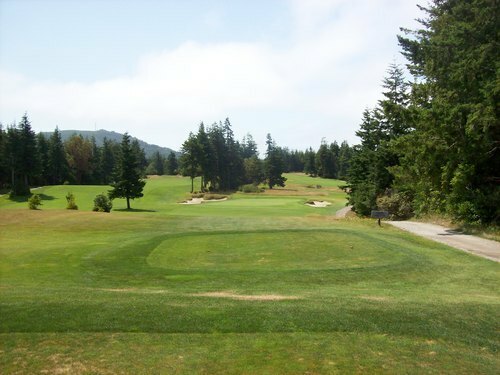 Some new people later came in and reopened the course again with the original name: Bandon Face Rock Golf Course. I was talking to the current manager when I was there. He and his wife basically run the place now and are considering buying it outright. They decided to keep the hickory clubs as an option on a trial basis, so if you call and reserve a set in advance, they’ll let you play with them. That’s what I did. I got there a little after 8:00 on Tuesday and I was the only one there beyond the manager. 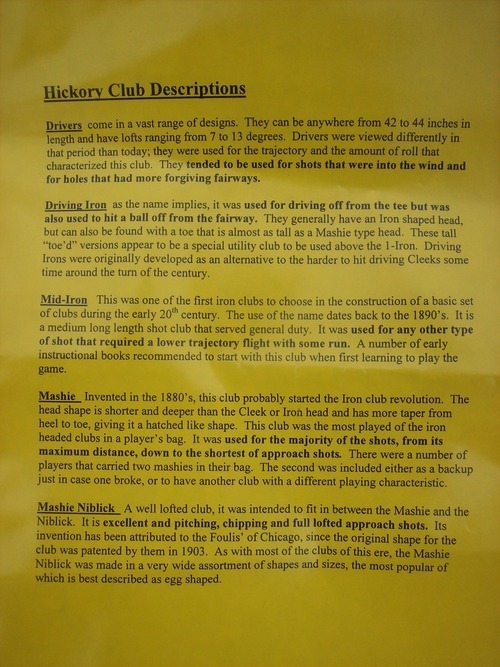 He got me my rental set of clubs, a description sheet of what each club was meant to do and let me go on my way. The price was quite steep and more than I expected to pay ($50 for nine holes with this set-up), but the set included three logo balls with a Bandon Face Rock logo. They were selling these modern replica balls in the pro shop for $6 a piece, so that explains a chunk of the cost there. (Left) mashie. 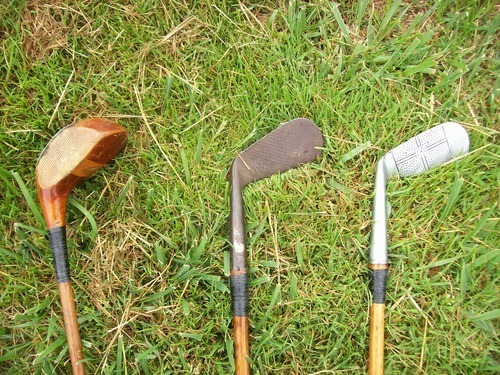 (Middle) mashie-niblick. 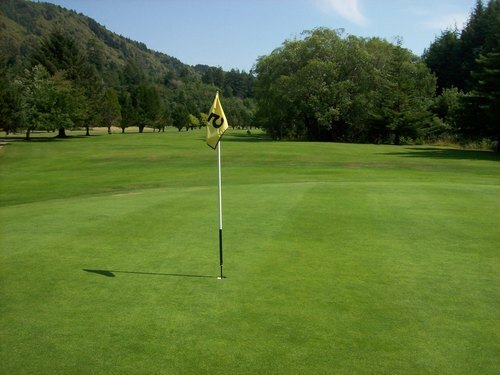 (Right) putter. 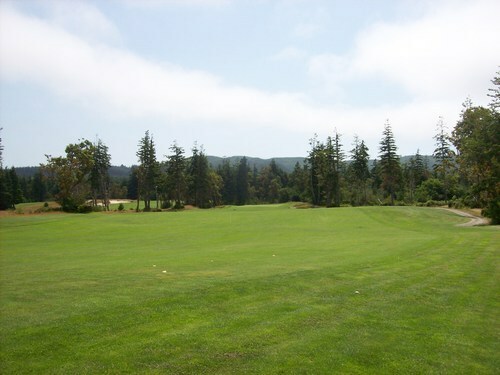 As I mentioned, the course was nothing special and was in pretty mediocre shape. 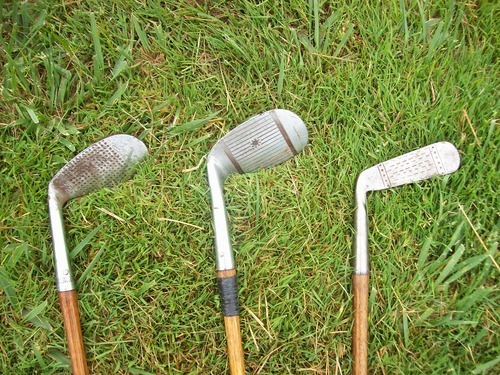 Still, the experience of playing with these old clubs and balls was fun. I actually did pretty well once I adjusted. One of the hardest things to get used to was the grips. They’re trying out two different styles here and my bag was mixed. One is a simple leather wrap, which has no cushion and is very slick. I was trying to be old school and played without gloves, so it took some getting used to. The other is a softer suede grip that is much more comfortable, but the leather ones seemed more period genuine to me—but what do I know? 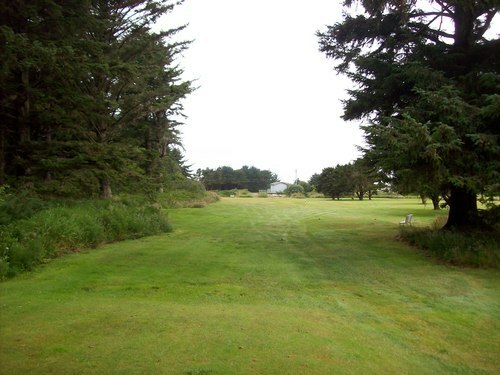 The course isn’t long and I played from one of the forward sets of tees. There were sand boxes on all the tees, but some were filled with more trash than sand and the manager explained that not a lot of people really try that anymore. 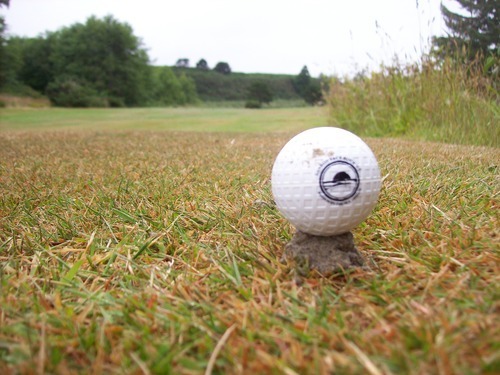 I did it whenever there was damp sand to work with and found it to be a perfectly effective way to tee up the ball and it was not hard at all to make a viable little mound to set the ball on. In all, it was a fun experience. 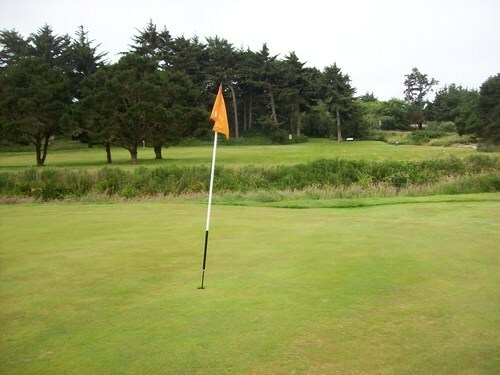 I am not sure it was $50 worth of fun, but it’s something I’ve always wanted to try and there’s no other significant reason to play Bandon Face Rock, so hopefully they keep renting the hickories and can find a better way to get the word out to all the people visiting Bandon for a “pure” old-fashioned golf experience. It would really be fun to play the resort courses with these clubs to get the perfect combination! 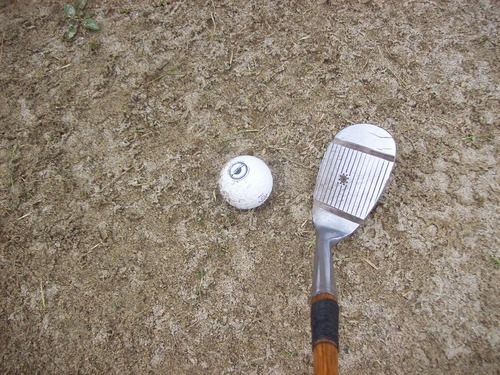 Mashie niblick is like hitting with a spatula, but pretty effective! 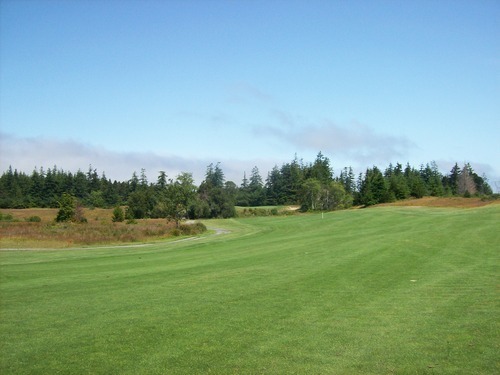 I’ve been wanting to play this course since it opened in 2007. I’ve always heard nothing but good things about it. 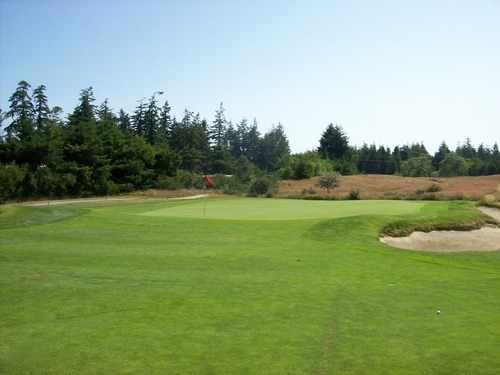 Not only is it less expensive than the resort courses across town, but it is regarded as a great layout that makes it a great companion course to those world-renowned links masterpieces. 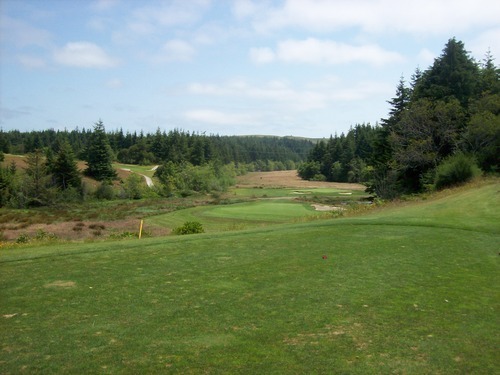 Most people will compare it to Bandon Trails and I can fully understand why. 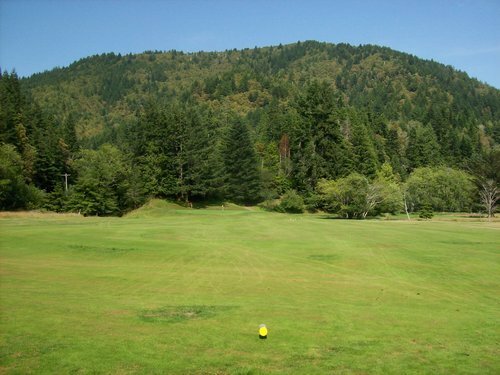 It definitely offers a lot of links traits, but still uses a forested setting and naturally undulating terrain to shape a great set of 18 distinctive holes. 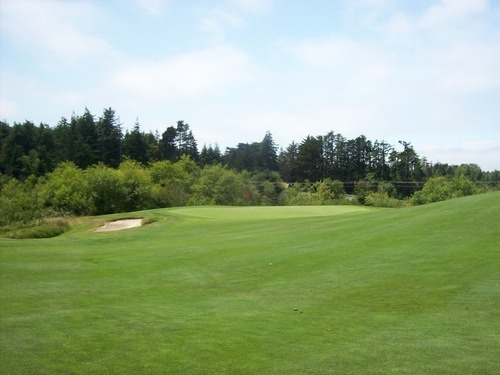 The price ended up being about $79 with a cart, which is still pretty steep for a slightly more locally focused course, but that’s not bad for the quality of golf you’ll encounter at Bandon Crossings. Our price included a bag of range balls, but they let us trade that for a yardage book. The atmosphere there is decidedly more casual. 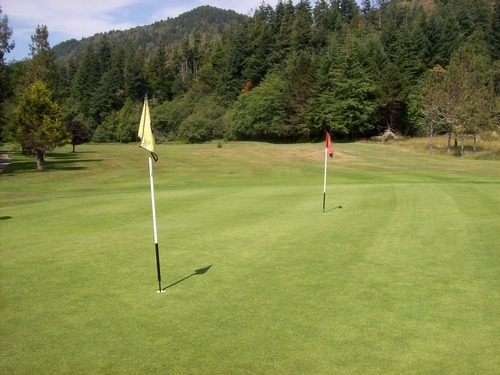 They take pride in being recognized as a great course that’s getting more and more recognition each year, but things are definitely quite low-key around the clubhouse and out on the course. It wasn’t too crowded, so my brother and I were able to enjoy our own pace. 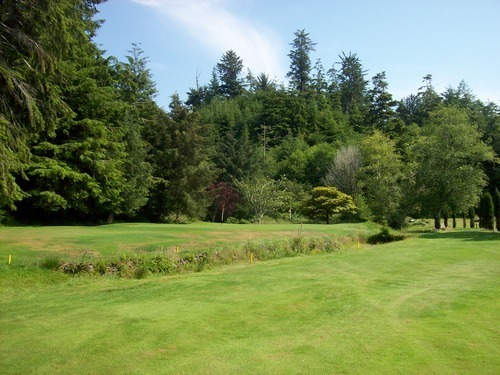 This course never gets boring with a lot of interesting holes and nice scenery throughout. 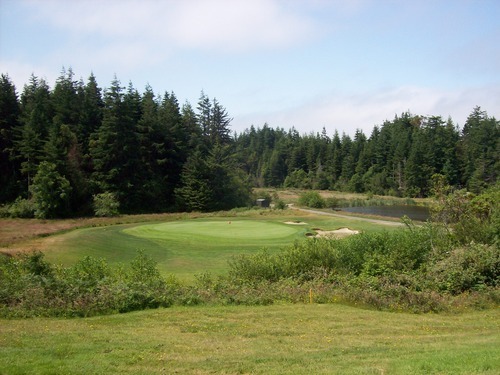 It’s nothing as dramatic as what you’ll find at Bandon Dunes, but very pastoral and serene on this pretty secluded property just off the highway. I found every hole to be unique and enjoyable, but none really jump out particularly in my mind now. 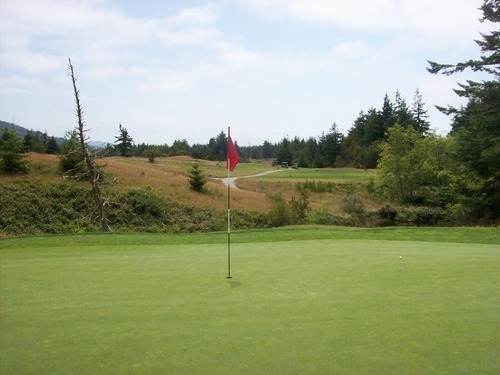 One hole of note is the 5th hole that can be played as a par-4 or par-5 depending on how you want to approach it. There are two greens here. One is short and off to the right and one is longer over a small ravine. The guy in the pro shop told me most 18-hole players will play the par-5 version and I agree that’s the better version of the hole. They do have a 9-hole routing here that makes the par-4 version of number 5 more sensible because then you’d actually go play nearby 15-18 as the final four holes after that (I think). 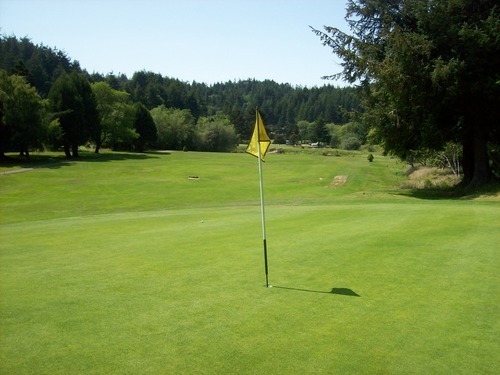 Bandon Crossings was in excellent shape all around. 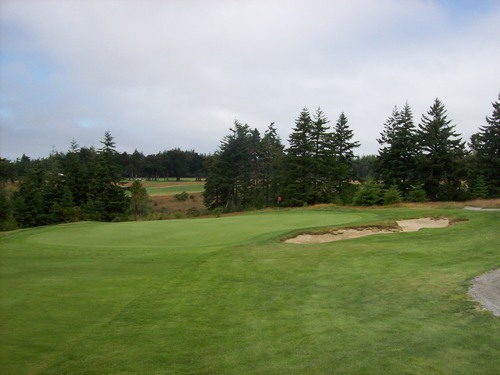 It is definitely more “green” than Bandon Dunes because of the different types of grasses they use (primarily poa annua if I’m not mistaken). The greens were quick and silky smooth like some of the ones I encountered earlier on this trip. 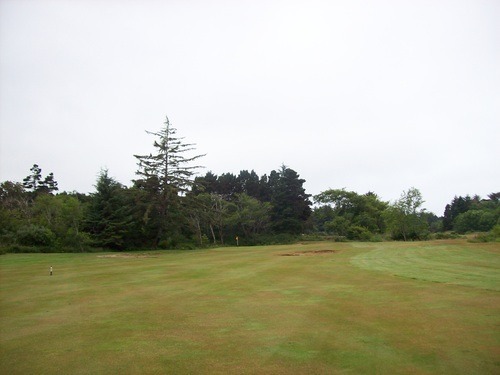 The fairways and rough areas were lush and I was loving the nice fluffy lies all day. 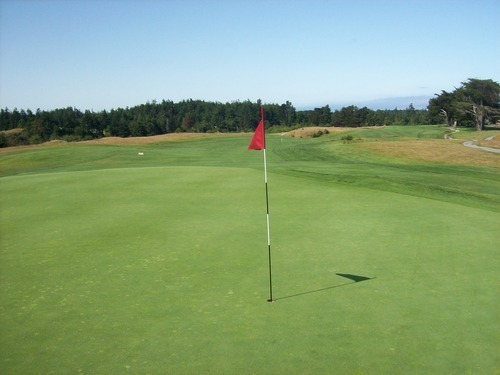 Of course, there is long fescue on outer edges of the holes and is obviously to be avoided because you will likely lose your ball. 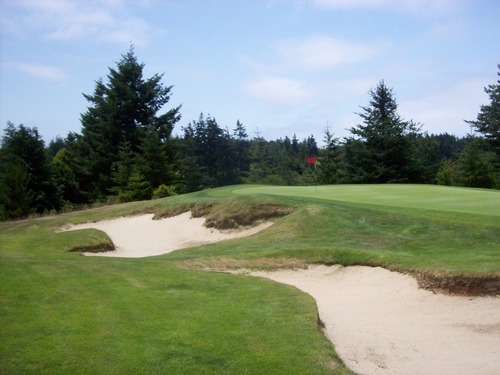 The bunkers are filled with super soft beach sand like you’ll find at Bandon Dunes. 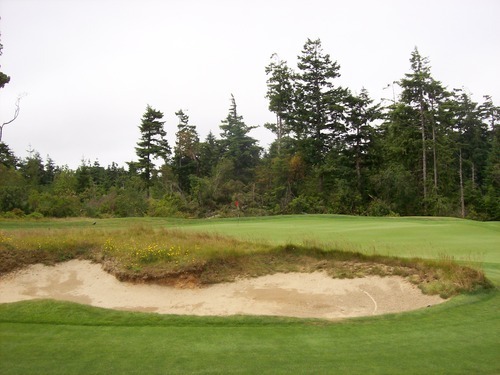 I always struggle with that kind of sand and Tuesday was no different in the couple of bunkers I found. 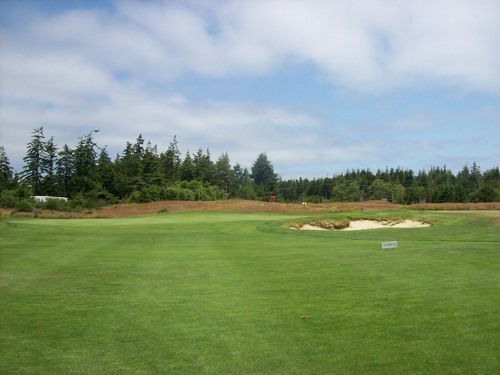 Would I play Bandon Crossings in place of a “bucket list” visit to any of the Bandon Dunes courses? No. But am I more likely to play it on future visits instead of shelling out a boatload of cash to play those other courses again? Heck yeah. I was very impressed with this course on all levels and, though the prices are still a bit steep, it’s a much more affordable option while in town. 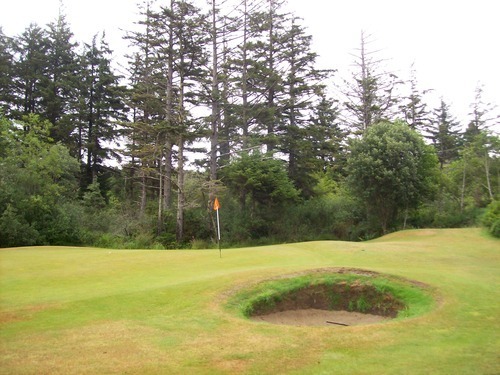 Even if you are out in Bandon on your pilgrimage to the resort, be sure to include a round at Crossings because you will also enjoy it plenty. It’s worth the visit! 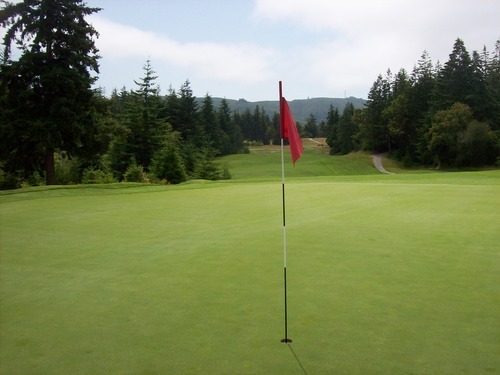 There was also a bonus round to be played on Tuesday afternoon. 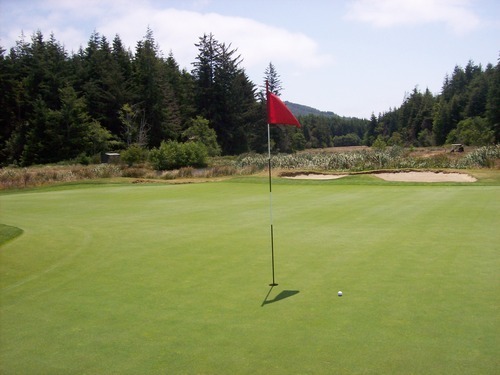 We finished quicker than expected at Bandon Crossings and decided to stop for another quick nine while rolling through Gold Beach (about an hour south of Bandon along the stunning Oregon Coast). 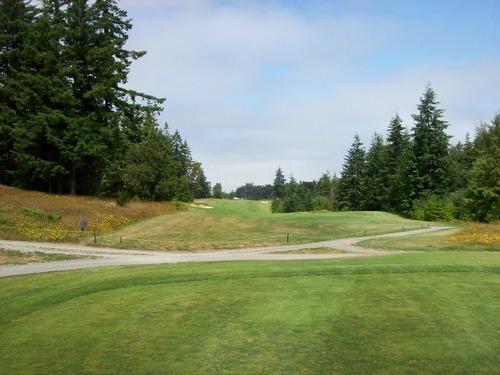 I drove out here once several years ago to scope out this course. I noticed something very unusual when I did that (more on that later) and otherwise saw what looked to be a pretty run-of-the-mill 9-hole course. But it was the perfect stop for us on Tuesday. We got there and could see it wasn’t crowded at all. We’d be able to get out and around quickly. We checked in and it was $26 for nine holes and a cart. We played through two old ladies on the second hole and then ran into nobody after that for a very quick nine, which was ideal. I didn’t realize that Cedar Bend was actually a regulation length course. I always assumed it was executive, but it has a pretty standard mix of hole lengths and plays to a par of 36 for the total nine. But what’s most interesting (and weird) about Cedar Bend is that, in addition to having separate tee boxes for front and back nine play, there are actually two holes/pins on each of the greens. The yellow ones are numbered 1-9 and the red ones are numbered 10-18. It’s rather funny looking and obviously raises questions about what to do if you actually end up in the wrong hole. I assume it’s a free drop, but what a bummer it would be to hit a hole-in-one on the wrong hole! 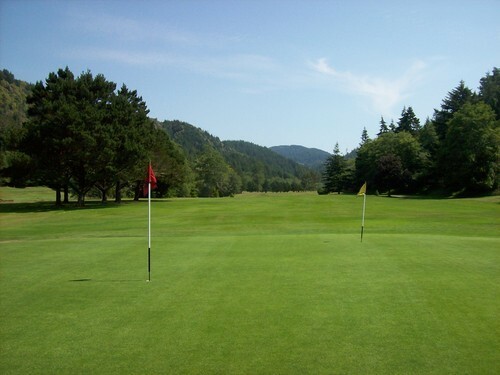 Of course, the alternate and more fun way you can play this course if you are not taking things too seriously is to just play to whichever hole you want. We just stuck to the yellows like we were supposed to, though. 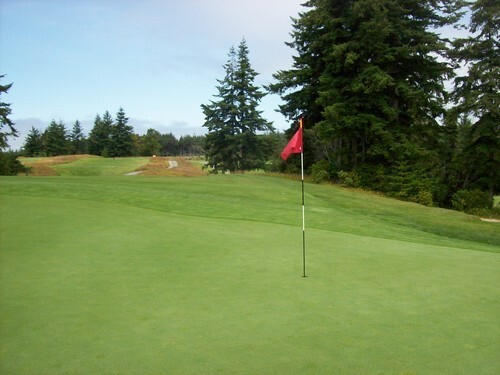 Though nothing particularly interesting or special, the course was more enjoyable than I expected and in decent shape all around (better than I would have imagined). Not too punishing, but enough to make you work for a good score. 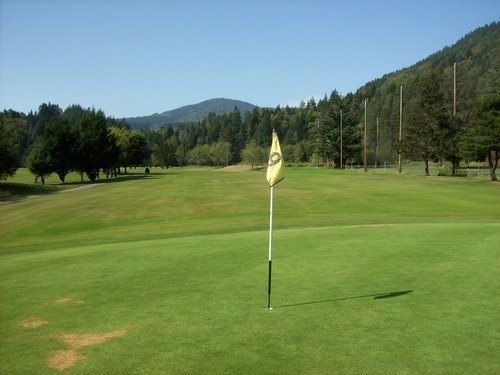 The scenery is pretty nice as the course plays down in a small little valley surrounded by trees and mountains. The lady in the pro shop was super nice and the people around there all seemed very friendly (seemed like a lot of old regulars), so it was a fun stop for a quick, cheap round on the drive home.